SHARK NIGHT 3D Made me want to sleep with the fishes! Oh man, I just returned from seeing SHARK NIGHT 3D and need to swallow two aspirin with a whiskey chaser! Now, mind you, I didn’t walk into this film expecting GONE WITH THE WIND but, after viewing the trailer, was hoping for a fun film like last year’s PIRANHA 3D. Instead of laughter and entertainment, I can only compare this experience to being stabbed to death with a butter knife; long, drawn out….and PAINFUL! A group of buff college kids spend a weekend at a friend’s Louisiana estate. Its the perfect party pad overlooking a salt water lake and complete with private pool, drinking games, and nobody over the age of 25. The proud owner is an attractive gal named Sara (Sara Paxton) who shies away from boys in favor of bonding with her pet dog instead. Of course her behavior is later explained as we are introduced to some of the local yokels who give hillbillies a bad name. These folks, are anything but your typical country bumpkins. Somehow they’ve managed to not only obtain some of the most expensive and state-of-the-art technology imaginable, but also acquire a legion of hungry pet sharks to do their bidding. Sara: Virgin Queen of the Bayou! The boys have themselves quite the assortment of man-eaters with even tiny “cookie-cutter sharks” getting a shot at big screen mayhem. It isn’t long before the happy go lucky gang starts becoming fish food, leading to some of the most ridiculous scenes imaginable. 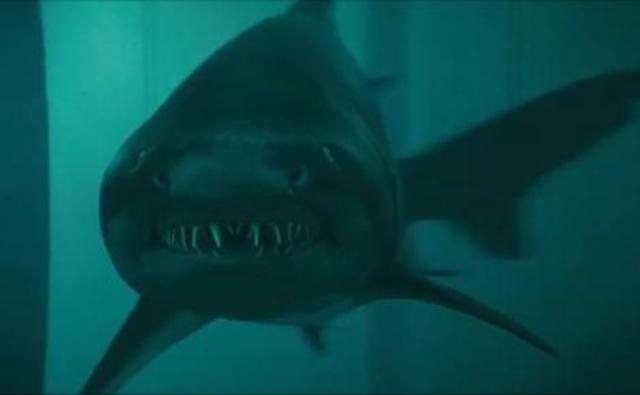 To say these CGI fish are aggressive would be a gross understatement. These sharks seem to be everywhere at once and travel at such super sonic speeds you half expect to see smoke coming out of their dorsal fins. Of course, I fully expected this based on the trailer and it was not my main source of contention. Peppered throughout the film are “intense” dramatic scenes, usually played between the male characters. In one scene, two GQ looking guys are having a cry-fest that made me shudder in my seat. When one of them learns that his girlfriend has just been killed, the two men bawl as he yells, “You don’t understand!!! She was the ONLY thing in my life that mattered!! !” Seriously? After it was revealed in the first scene that you’re not only graduating from college but are on the fast track to becoming a millionaire sportsman? The majority of the movie revolves around the characters trying to get help and away from their paradise-turned-prison. Apparently that lush mansion of theirs has everything… but a telephone! The most ridiculous source of drama, however, revolved around the mysterious Sara and one the of the scarred locals, Dennis. After she thanks her “ex” and sends two of her pals off with him and his crony (who redefines bad oral hygiene) to get help, she sits on the dock and reveals all to one of her potential suitors. I’m telling you, after she gets through sharing her history with Dennis (in a back-story so convoluted you’d expect to see it on a daytime soap opera), you want to literally smack her upside the head for gleefully sending her friends with him! At this point I was texting my co-blogger and revealing my desire to walk out of the theater. My only obstacle was my bringing my young, shark-obsessed son along with me who loved every minute. So I stayed to the end, even enduring one of the villains’ monologues regarding the motivation for their actions. For this I have but four letters; OMFG! As for the 3D there were some good underwater scenes with the seaweed appearing close enough for you to reach out and grab it. There were also a few explosions that worked well with the format. Unfortunately, all the parlor tricks up Hollywood’s sleeve couldn’t make this movie even remotely watchable! Save your money (and your sanity) and avoid this one at all costs! This entry was posted in Man vs Nature!, Movie Reviews and tagged HORROR MOVIES, Killer Sharks, SHARK NIGHT 3D. Bookmark the permalink. ← An Interview With The Girls From MIDNITE MAUSOLEUM!